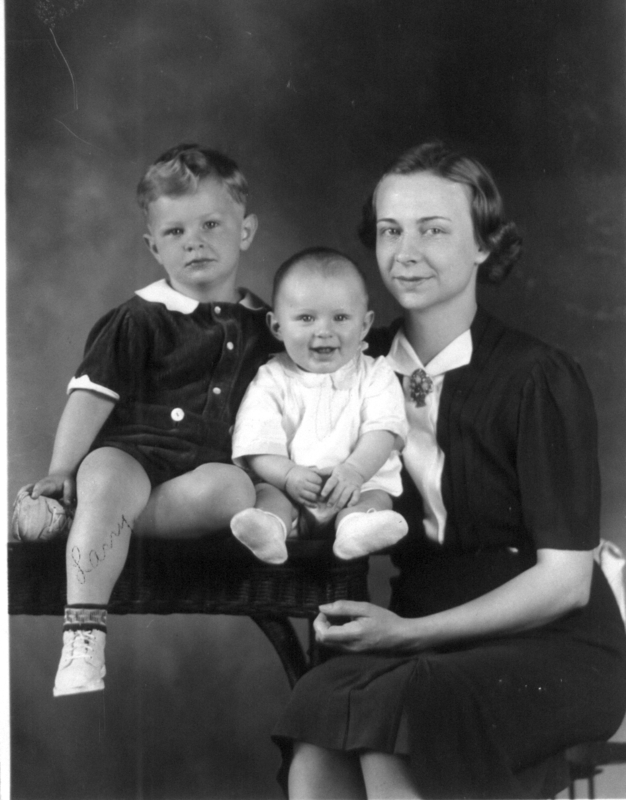 Jack (between his mother Margaret and his brother Larry in the picture on the right) was born October 3, 1938 in the small town (population 3,000) of Lawrenceburg located in southern middle Tennessee. He was the second child in a family of four boys and two girls. He spent his pre-school years moving from place to place across the south as his dad worked as a brick mason building residential and commercial buildings. At about two years of age he fell out of the second story window of the house where he lived. Fortunately, he fell onto a roof and rolled into a bush suffering only bruises. His Dad helped build Reynolds Aluminum plant in Sheffield Alabama about 1940 and when the plant opened he was employed as a brick mason working on the maintenance of the brick-lined furnaces. Soon he was promoted to Foreman over that area where he spent the rest of his working career, commuting back and forth daily forty-five miles to Lawrenceburg. 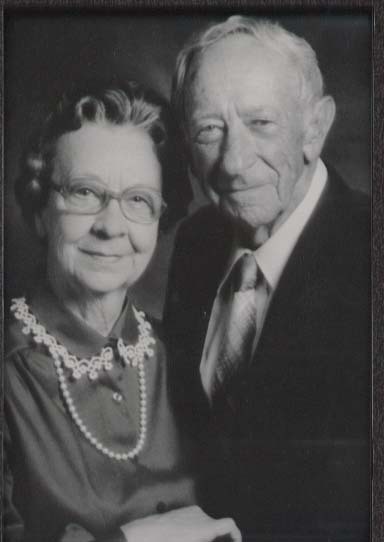 He passed away in December of 1987 and Jack's mother passed away in May of 2001. Life in Lawrenceburg during the early forties was a lot like living in Mayberry. Most houses were heated with wood stoves. Just outside town few houses had electricity or running water. The public square had two hitching yards behind the stores where horses and wagons could be left while shopping. There were several blacksmith shops in town with one just down the street from Jack's home. And there was a war going on. Every Saturday Larry and Jack would go to the cowboy movie at the Princess Theater on the square. Before the movie the newsreels gave reports on the progress of the war. There were lots of pictures of fighter planes in action. Every kid who watched these newsreels wanted to be a fighter pilot. 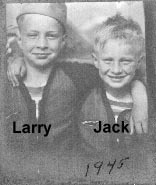 Jack attended Sacred Heart School for grades one through eight, walking to school with his brother Larry every day. It was a three room school, with three Sisters of Mercy teachers. He took his turns as an altar boy at the Catholic church next door. He and Larry joined the Cub Scouts as soon as old enough and remained members of the Scouts through high school. In addition to caving, camping, swimming, and all the things Scouts do, Jack was active in organized sports. When he moved on to Lawrence County High School in 1952 he was on the baseball team and the football team. In October of 1955 he broke his arm in a football game at Columbia. While in high school Jack and several friends traveled by rowboats down Shoal Creek from Lawrenceburg to the Tennessee River near Sheffield Alabama, a distance of over 30 miles. 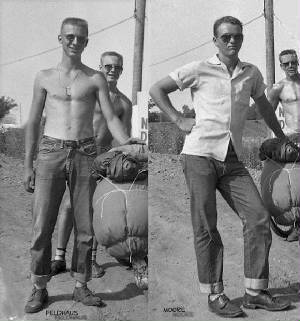 Jack and Jimmy Moore traveled over a thousand miles by bicycle across several southern states, ending up in Tamp FL. That's Jack on the left above. On graduating from high school in 1956 Jack entered Tennessee Tech University in Cookeville Tennessee majoring in Engineering. After one year, he went on active duty in the Naval Reserves and attended boot camp at Bainbridge Maryland. After finishing boot camp he applied for and was accepted for the Naval Aviation Cadet program. While waiting for the next class to begin, Jack was stationed at Willow Grove Naval Air Station north of Philadelphia where he met and married Susanne Colligan. Left to right. Larry Feldhaus, Jack's wife, Suzanne Colligan Feldhaus, Frank Feldhaus, Kim Holthouse (cousin), Jack Feldhaus, B.G. "Pop" Holthouse (grandfather), Bob Holthouse (uncle). Jack and Susanne went to Pensacola Florida where Jack learned to fly while Suzanne lived off base because marriage wasn't permitted for cadets. Following graduation and receiving his wings, Jack was assigned to VA-122, a Pacific Fleet Training Squadron at NAS North Island in San Diego. There he flew Skyraiders on bombing, rocket, and gunnery missions from Brown Field (south of San Diego), NAS El Centro and MCAS Yuma. Following requalification for carrier landings on board the USS Oriskany CVA-34 in the first week of March 1960 Jack was transferred to VA-25 at Mofitt Field near San Francisco, still flying Skyraiders. He was on WesPac cruises aboard the USS Midway CVG-2 from February 16 to September 28, 1961 and from April 6 to October 20, 1962. When his tour of duty was up, Jack had to make a decision. Should he leave the Navy and fly commercial jets or stay in the Navy? He was offered regular Navy status to stay in and that was the only inducement he needed. Jack's next assignment was with VT-30 in Corpus Christi Texas as an instructor of AD pilots. 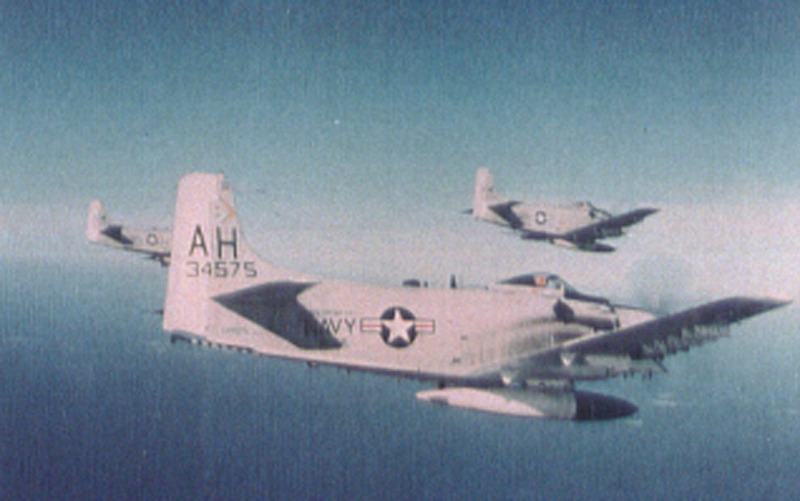 From July 1960 until the late 1960's VT-30 was the source of Skyraider pilot training for the US Navy and foreign nations. 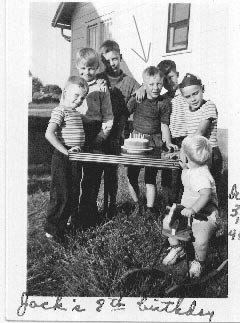 He was the instructor for a class from April to August 1963 consisting of the following: Glen Kalember (deceased), Charlie Clydesdale (deceased), Jim Bean (deceased),one name not remembered, and Scotty Wilkes. 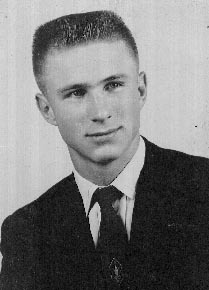 The death in combat of his students had a major impact on Jack and utlimately led him to request a tour of duty in Vietnam. In 1965 as the Vietnam war was heating up, Jack requested an assignment that would get him to Vietnam and was assigned to VA-152 in Alameda California, also near San Francisco. 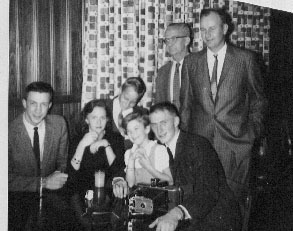 By this time Jack and Susanne had four children, two boys and two girls. One day Susanne had enough of Navy life and loaded the children in the car and drove them to her parent's home in New Hope Pensylvania, above Philadelphia. While they attempted reconciliation, they divorced later that year. Suzanne never remarried and passed away in 1990. 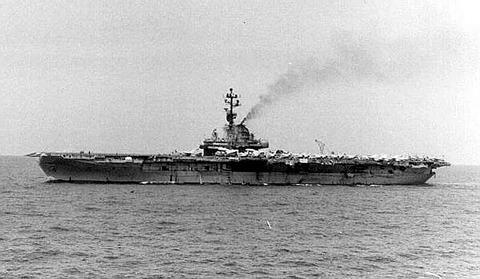 Jack departed the US in May of 1966 aboard the USS Oriskany, CVA-34, with VA-152. Click here to learn more about VA-152. Jack had been on Dixie Station off South Vietnam for 8 days and had flown several missions into South Vietnam when the USS Oriskany moved north to Yankee Station off North Vietnam and began launching missions into North Vietnam on July 8. 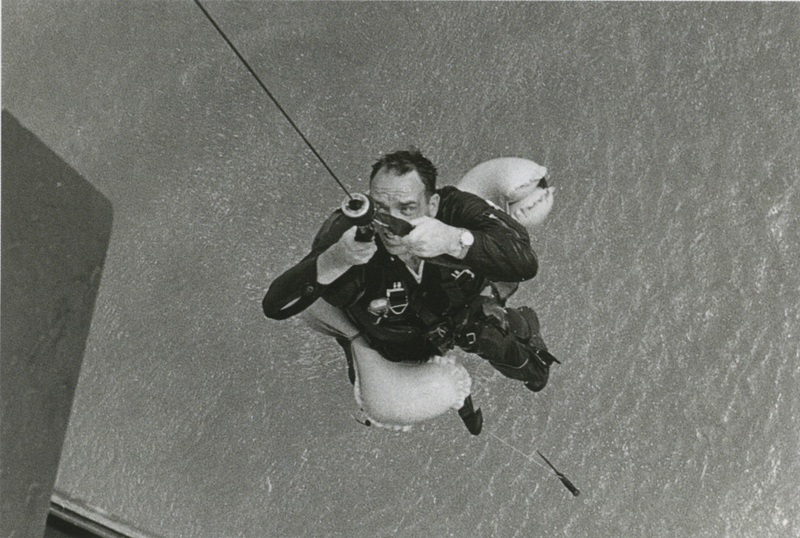 Three days later, Jack was involved in his first rescue effort of a downed Navy airman. He was one of four pilots launched on July 13 on a mission to travel further north into Vietnam than any other attempted rescue. 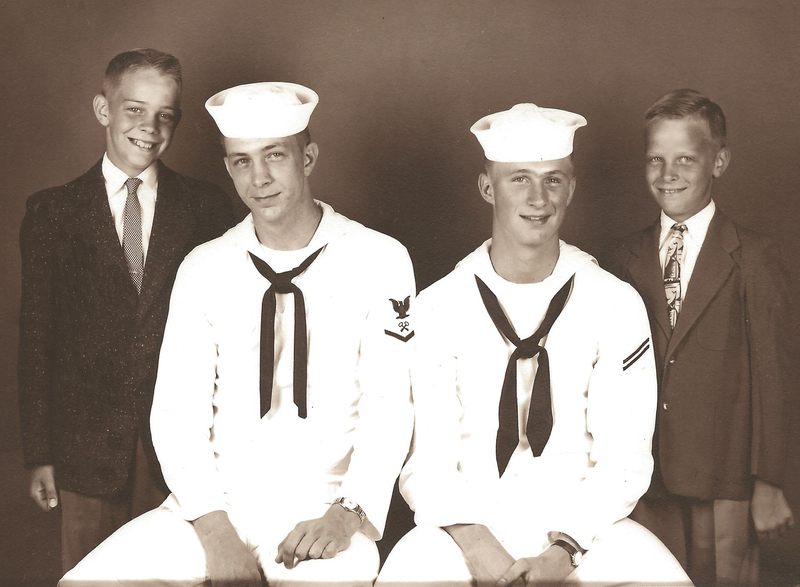 As his commanding officer and his wingman flew above, Jack as wingman of LCDR Eric Shade, accompanied the helicopter to the downed pilot, LTJG Rick Adams, and fought off attacking forces and avoided AAA while guiding the helicopter out of the country. Rick Adams stayed in the Navy and went on to become a Blue Angel. On 31 August Jack and JTJG Fred Guenzel escorted a helicopter into the middle of Haiphong harbor to pick up LCDR Tommy Tucker of VFP-63 off the USS Oriskany. This rescue is reported to be one of the most dangerous in the Vietnam War. The photo of LCDR Tucker being lifted into the rescue helicopter is one of the iconic photos from this war. 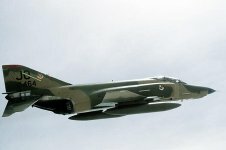 On August 20 1966 a U.S. Air Force RF-4C Phantom aircraft took a direct hit from ground fire during a night photo run while dropping flares in North Vietnam. The pilot, Edwin Tiffany Hawks ejected. Jack and his wingman were in the area and heard his distress signal. Jack made contact with Tiff Hawks who was taking fire from ground troups. Ignoring anti-aircraft fire, Jack provided air cover for Tiff until he could be rescued by a Navy helicopter. Jack and his wingman escorted the helicopter to the safety of the ocean and then returned to search for the other crewman while heavy anti-aircraft fire continued. The explosion from the ground fire may have incapacitated the other crew member, Richard M. Milikin III, who was in the rear seat. He was never recovered. 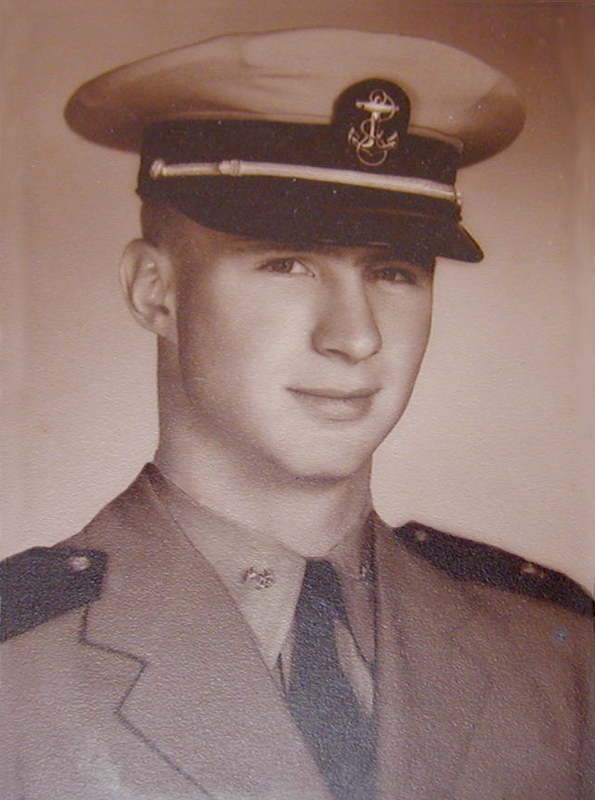 On October 6, 1966, three days after his twenty eighth birthday, Jack was shot down over North Vietnam when his A-1H Skyraider was hit in the right wing by 37mm antiaircraft fire. He was listed as missing in action for almost ten years before being declared killed in action. He was a Lieutenant when he was shot down and was promoted to Commander by the time he was declared KIA. In 1995 when the U. S. Government was contemplating a normalization of relations with Vietnam, Margaret Feldhaus said from her new home in Pueblo, Colorado where she had gone to live with her daughter. "Oh dear, It's been so long, it's hard for me to sort out my thoughts on the subject." But Mrs. Feldhaus, 82, gathered her emotions. "Just like his family had to get on with their lives, we need to get on with some sort of peaceful relationship with the two countries. I thought it was time. My son had four children, and I'm so glad to have those grandchildren and great-grandchildren from him. They can get on with their lives now, too." 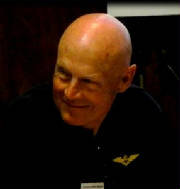 Between 1993 and 2001 several joint U.S./Socialist Republic of Vietnam teams attempted to locate Jack's crash site and recover remains. The crash site was tentatively located in 1996 and remains recovered in 2000. 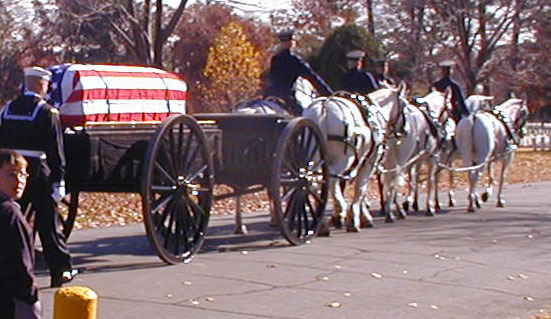 After positive identification of the remains a funeral, with full military honors, was held at Arlington National Cemetery on November 20, 2001. It was attended by thirty seven friends and family.